Pages are generally for content that will not change very often and can be found in the main navigation. 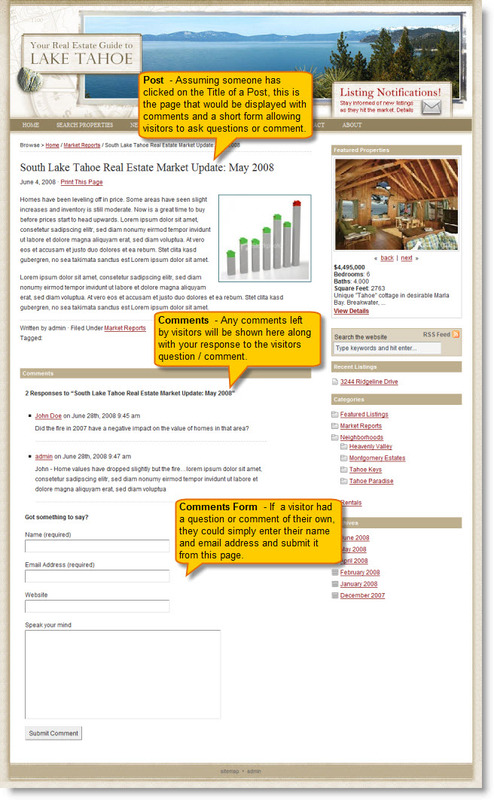 Examples of Pages would be: Home, Search Properties, New Listing Notifications, Contact, About Me, etc. We recommend keeping the number of Pages in the main navigation to a minimum. You don’t want to overwhelm your visitor with too many choices. Also, while the majority of visitors will be coming to your site to search for property, you want it to be easy for them to find what they are primarily looking for. Note: Generally we will create a Page named something generic such as ‘Misc’ for Miscellaneous, and hide that page and it’s subpages from displaying in the main navigation. This section is used to store pages that you want to link to from various places on your website but don’t want them to show up in your main navigation. For example, we usually create a page on your site called “Thank You”. The Thank you page is where visitors are redirected after they submit the form on the Contact page or What’s My Home Worth page. 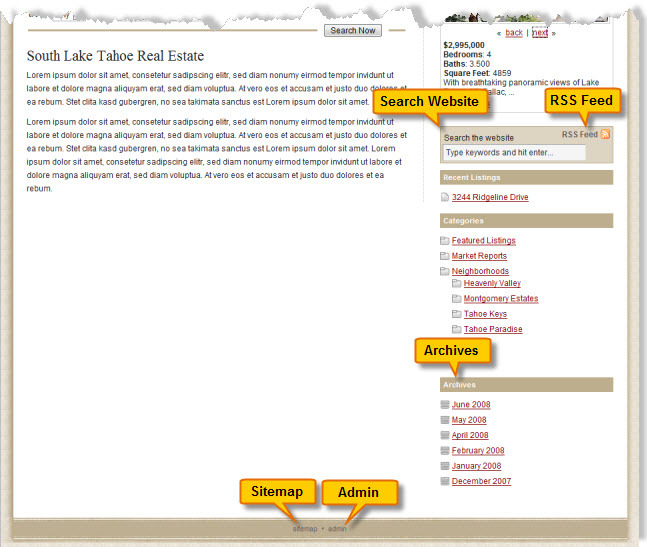 Another example of a page that we have created and do not want to show up in the main navigation is the Sitemap. The link to the Sitemap is typically located at the bottom of your web pages. Categories will usually be located on the left or right hand side of your site and displayed vertically so there is room to grow this section. You may start out with the basics such as Featured Listings, Neighborhoods and Market Reports…but this list can be edited by you to contain anything you wish to discuss and display with your visitors. 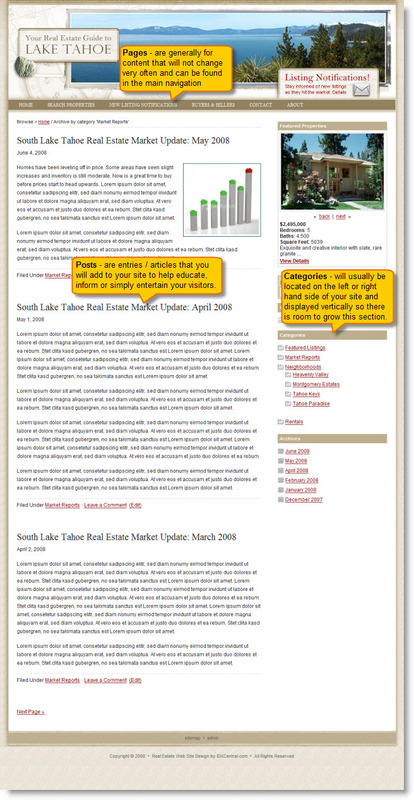 Each Category you create will contain Posts (articles you have written). Posts are at the heart of what makes a blog site great. Posts are entries / articles that you will add to your site to help educate, inform or simply entertain your visitors. These Posts are added to the Categories you have created to help organize your website content. For Example: Let’s say you created a Category called Market Reports so you could keep visitors informed of what is happening in your local real estate market. You can easily respond to visitor’s comments as well, further showcasing your knowledge and experience … plus, developing some type of rapport with your visitors. If a visitor had a question or comment of their own, they could simply enter their name and email address and submit it from this page. With a Blog enabled website, not only do you benefit from being able to add and categorize content quickly and easily on your site, but a major benefit to this type of site is that visitors are encouraged to participate and interact…giving you a chance to develop a connection with them that you didn’t have before. If you don’t wish to interact with your visitors in this manner, we can simply turn off the ability for them to comment on your content. This tool will Search your Pages and Posts and help visitors find information quickly and easily on your site. An RSS Feed allows people to subscribe to your feed for free and get notified of your posts on a regular basis. For a more detailed explanation and fun video see our post about What is a RSS Feed? WordPress automatically notifies popular Update Services that you’ve updated your blog by sending a XML-RPC ping each time you create or update a post. Now people browsing sites like Technorati or Sphere can find your most recent posts! This section will be automatically generated as you add Posts to your website. There is nothing to maintain and visitors can again use this to find information you have added to your site. This will be a map to all Pages and Categories on your site so that visitors and search engines can easily find information you have added to your site. Typically we will add a link labeled “admin” at the bottom of your site so you can quickly login and access your website’s administrator. As mentioned, adding new pages or content to your site is very simple. One category we recommend you add is Featured Listings. Here you can showcase your listings to not only impress your sellers, but add content to your site that search engines can index. You can add as many images or as much text as you would like to describe the property. Add videos, maps, and more. Again, these are just some of the basic benefits of this type of site. The more you use it and explore, the more you will find it is capable of doing.